Clean dried red chile pods, removing stem and seeds. Rinse under warm water. Place a in a large pot of water and bring to a boil. Boil for several minutes, until chiles become flexible. Remove chiles from pot, and place them in a blender. Add water from the pot until the blender is approximately 1/3 full and blend. Work through sieve to remove any remaining skin or seed particles. Lightly brown pork steak in 1 tablespoon olive oil. Add chile sauce and additional water, until sauce reaches desired consistency. Season with minced garlic and salt to taste. Simmer for 15-20 min. 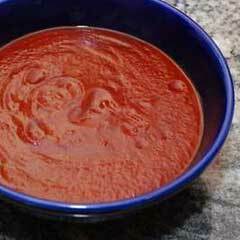 It is best to let the sauce sit for an hour or so for flavors to blend. Reheat and enjoy with warmed flour tortillas.